"I remember one or two things that really impressed me about Paigham. 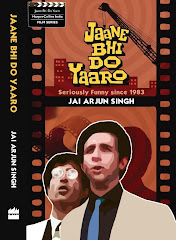 One scene was Dilip Kumar’s introduction – he doesn’t have a place to stay so he’s sitting on a footpath under a lamppost and reading, I think it was Gandhi’s My Experiments with Truth. And then there’s a beautiful scene, which was copied later by Salim-Javed for the Amitabh film Dostana. Now this scene had nothing to do with the main narrative – you could easily have cut it and thrown it out. But it was a beautiful, static, fortuitous moment — like we say, 'It wasn’t planned, but it happened somehow.' Vyjayanthimala is in love with Dilip Kumar, and after singing a song together they are sitting and she casually asks, “There must have been other girls beside me in your life?” Dilip Kumar says, you are the only one. But she keeps saying there must have been some girl in school or college who fascinated you, and when she keeps probing he decides to invent a story about a girl and a fantastic love affair – a chance meeting, which develops into a major thing. And as he spins the story, Vyjayanthimala starts getting more and more jealous. Now the thing here is that she has to play the comic foil – and if your foil is not working the comedy can fall flat. There’s also a famous scene in Pyaar Kiye Jaa where Mehmood is narrating the script of a film he wants to make, Mehmood is using all the tricks at his disposal, but the scene wouldn’t have worked if Om Prakash hadn’t given the proper reactions at the right time. In comedy, it often looks like one person is doing the main work but the other person is equally important. Even Amitabh can't carry a whole comic scene on his own shoulders. When this Paigham scene was redone in Dostana, it fell flat because Zeenat Aman couldn’t play the foil the way Vyjayanthimala did." Note what Kundan says about how the scene, though one of the best things in the film, could easily be “thrown out" since it had nothing to do with the main narrative. This is true of many of the great serendipitous (or “inessential”) moments in cinema — so many of them retain their vitality long after the film as a whole has become jaded. In fact, watching Paigham on Amazon Prime recently (a good print), I found this was exactly what had been done: the scene was treated as inconsequential and ineptly shortened. 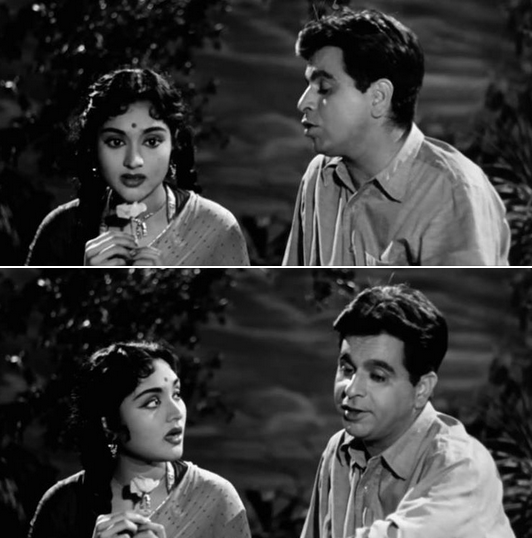 (Vyjayanthimala asks Dilip Kumar if he had ever sat with another girl the way he was sitting with her, and he replies “ISS tarah? Nahin”, and that’s it - abrupt cut to the next scene. Makes no sense.) Luckily the full version is on YouTube, though not in a good print.